Might & Magic Heroes VII is out in just over a week, and Ubisoft hasn't bombarded us with trailers detailing every last feature, character, or mode in excruciating detail. No, it's saved it all for this '101' trailer, which offers a helpful overview of the latest Heroes of Might & Magic/Might & Magic Heroes game. Will seven be the lucky number? Will the fans like this one, or complain that it isn't as good as HoM&MIII or V, which seem to be regarded as the highpoints of the series? Developers Limbic, hot on the heels of their fondly received Might and Magic X: Legacy, seem the right people to give it a good old go, at any rate. 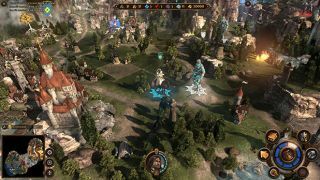 Might & Magic Heroes VII is out September 29, and Richard Cobbett wasn't all that certain about it when he played it back in March.